There has been an exciting development since my post from a couple months ago entitled, Hey Google! Where's The Love For Podcasting? 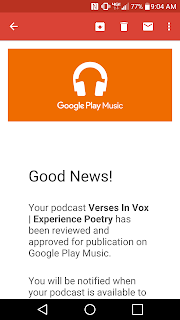 Yesterday, October 27, 2015, Google announced via their Official Android blog that they’ve launched a Podcast Portal for show producers to submit their content for inclusion in the soon-to-be rolled out podcast directory in Google Play Music (GPM). This is very exciting news for podcast creators as this will open up this medium to a potentially massive audience. In my opinion, this is a long overdue move by Google, but I’m very glad to see that they’re making a move into the space and I’m very optimistic about the possibilities. The submission process is very quick and easy. You simply navigate to the Podcast Portal, paste in your RSS feed URL. Google then looks at the email address in your feed and will send you an ownership verification code to that email address. Either paste that code into the filed in the Podcast Portal or click the link in the email. Next, the RSS feed info will populate into the system and you just click the button to submit your show. You’ll then receive an email letting you know that you’re show has been reviewed. All three of the shows I’ve submitted thus far have been reviewed and approved within just a few minutes. If your show is rejected for some reason I assume that you will receive notification of that as well. Just remember that the actual user interface has not yet launched. At this point, the Google Play Music team is just trying to build up the catalog of shows so the content is readily available at the time of public launch. For more information and details about this development I’d recommend listening to a special episode of Libsyn’s The Feed podcast in which Rob Walch interviews Googler, Elias Roman. The interview is contained in the first 15 minutes of the episode, but if you use Libsyn as your media host then it’s worth listening to the full episode to learn how Libsyn will be interfacing with GPM.